It's time for the annual running of the bladder, as Mountain Dew once again teams up with a major fall video game release to market alien flavors of its citrus-like carbonated beverage. Now with lemonade flavor! For the blissfully unaware, Game Fuel is the label Mountain Dew uses to market limited edition flavors to the controller-gripping masses. It began way back in 2007, when folks on hand for the launch of Halo 3 in New York City (*raises hand*) were subjected to bubbling citrus-cherry trauma in tiny paper cups. It was... interesting. Since then Game Fuel has become somewhat of a regular thing. In 2009, World of Warcraft was the target game, with one flavor assigned to each of its two warring factions — the Alliance (blue wild fruit) and the Horde (the same Halo 3 crap). Call of Duty: Modern Warfare 3 was the target of 2011's promotion, with original cherry-sick joined by some sort of green tropical thing. 2012's Halo 4 "enjoyed" a resurgence of the original flavor once more. Last year Game Fuel embraced the next-gen, with citrus-cherry promoting Dead Rising 3 and a new blue flavor, "Electrifying Berry", helping along Ryse: Son of Rome. And now we're back for Call of Duty: Advanced Warfare. Mountain Dew and Doritos, a pair of products with no negative gaming connotations whatsoever, have teamed up once again to offers some sort of codes or something. That's not important right now. 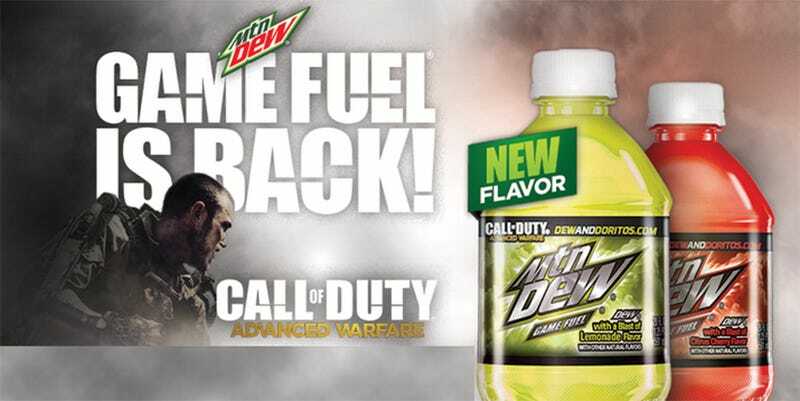 What is important is that Game Fuel now comes in lemonade flavor, with a taste I can only imagine is vaguely lemonish. Finally the king of citrus gets its dew.